The Libyan territory, closed by political boundaries straights but not morphological, bordered to the the Mediterranean Sea (900 km), with Algeria and Tunisia to with Chad and Niger, with Sudan and Egypt. The country is mostly occupied by the Sahara. Sandy or gravelly east (desert Calanscio), dry and rocky south-west (and Murzuk Ubari), in the Fezzan desert, only along the Mediterranean coast has hills (Jebel Akhdar) and short, fertile plains (plain Jefara). Extreme south rise the mountains Tibesti (3000 m) and the plateau of the Tassili (1000 m). 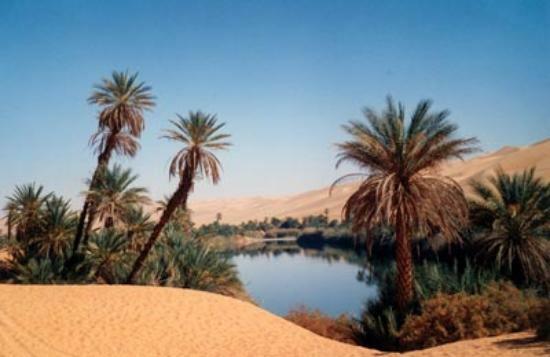 In Libya there are no permanent rivers, but only on a seasonal wadis. Appear within a few oasis of Kufra and those are the greatest Sabha. The climate is extremely arid, characterized by high temperature, hot dry winds that blow from the desert and rare winter rains along the coast (max. 100 mm at the end of December). Summer is very hot along the coast, where the moisture can be very high, you reach 30 º C while in the south can be as high as 50 º C. In the desert the temperature between day and night is always remarkable. In winter the average daytime are at 20 º -25 º C maximum and the night of 5 º / 6 º C and minimum of 0 º C with peaks in December and January. In winter the climate is cooler, however, much cooler along the coast where rainfall was the highest (100 mm) at the end of December. In the spring blows ghibli, a hot dry wind from the desert that can significantly raise the temperature. National holidays are March 2 (foundation of the Jamahiriya), June 11 (anniversary of the evacuation of U.S. military base Wheelus Field), September 1 (Day of the Revolution, Tripoli, parades, marching bands and folkloric companies) and 26 October ( Day of mourning: all activity stops, public phones do not work and ferries, close the borders). In October Harvest Festival is held on the dates and at New Year festival in Ghadames to Ghat Tuareg (30th, 31 December and 1 January). Interesting is also the Feast of Qasr Kabaw held in April. Are observed all the Islamic holidays such as New Year’s Eve and the end of Ramadan, the birthday of the Prophet Muhammad. They follow the Islamic lunar calendar which means that each year fall at different times. You need special care hygiene during your stay: purifying water or drink bottled water to avoid unpleasant diarrhea, not eating raw vegetables, peel the fruit. Local hospitals are often very far from Western standards and lack of ambulances, for less serious situations are reliable local doctors. Following the recent suspension air embargo is easier for medical evacuation, which remains the essential conclusion of a good private medical insurance. Medicines are not readily available, so if you need some special medicine portatevene a good supply. To enter Libya no one is required vaccination is required only yellow fever vaccination for travelers coming from infected areas. no prophylaxis is not considered necessary. Cotton dresses, a sweater and a heavy jacket in the evenings in winter months, personal hygiene products (soap, shampoo, toothpaste, toilet paper is difficult to find), hat and sunglasses; peril desert clothing heavy for the night, sturdy shoes and sandals, water bottle, pharmacy, travel goods (in addition to basic medicines, eye drops, tablets to purify water, salt and dextrose tablets, moisturizer and anti-sunburn), flashlight and batteries parts, multipurpose boxcutter, film, anti-sand plastic bag for the camera. We recommend using a backpack or soft bag, the bags are quite rigid unsuitable. Libya is a Muslim country and therefore it should pay attention to clothing (avoid low-cut and skimpy clothes for women, men would be better advised to wear long pants and tank tops to avoid): This is true even if you’re in the desert where you can always meet with local people or military control functions. The expressions of affection between men and women, even married, are frowned upon. During Ramadan you should not eat, drink or smoke in public during daylight hours. Remember that you do not eat, you do not need nor do they salute with his left hand. Always ask permission before photographing people, especially women, and not to photograph potential strategic targets. In the Libyan desert is important to know that there is a fundamental rule of conduct: who notice any person or a car is forced to go to them even without any kind of signal. Then follow this rule and do not try to dodge the issue because such behavior could be misinterpreted especially when the vehicle crossed considered to belong to a patrol around the controls. The desert is a wonderful place and must remain: avoid thus polluted with the remains of your camps. Take a deep hole and throw your garbage, burn them and cover it all. Since September 2009, no longer need to be equipped with tibro bilingual and certified translation of your passport. Entry visas are obtained in Libya at the airport and at border points. This formality is initiated only after it was booked the trip (at least 25 days prior to departure). IMPORTANT: Under the new law regulating the granting of visas at the airport every tourist must demonstrate at least 1000 USD or equivalent in Euros or a credit card issued by an international school. And ‘formally revoked the ban for Italians born in Libya back into the country. Each participant is required to personally check the validity of your passport (which must not expire within six months from the date of departure), the presence of at least one free page and validity of the stamp.